About "NIV Pathways Bible Chocolate/Charcoal Duo-Tone"
This eBible makes it easy to explore God's Word, opening up your heart and mind to a deeper relationship with Jesus. By providing the full text of the New International Version (NIV) Bible along with a wide range of reading paths, this Bible makes it easy to enter into God's Word . . . so that his Word can enter into you. Maybe you want to spend 30 days getting to better know Jesus. Or maybe you want to read the more obscure parts of the Bible?the not-so-famous stories. There are 20 of them provided for you. Have you ever thought about reading through the entire Bible in a year? A reading plan for doing so is in this Bible too. And if that seems too intimidating, try the 60-day overview of the Bible. 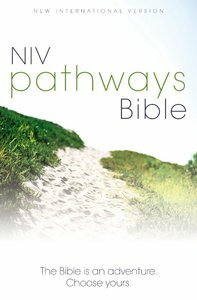 The NIV Pathways Bible has so many options that you'll find fresh new ways to enter into God's Word ... so that his Word can enter into you.